When I first started owning and working with birds, I was taught that all pet birds should have their flight feathers trimmed to prevent injury as well as to encourage the human-bird bond. But over the years I have discovered that the decision to trim a bird’s wings is quite controversial, and in many instances we are doing a disservice to our clients and their pet birds if we automatically trim. Now more than ever the avian veterinary team is aware of the need for captive parrots to be stimulated both mentally and physically. In many instances, birds that do not fly become sedentary and are more likely to develop a myriad of health problems including obesity, arthritis, pododermatitis, atherosclerosis, or hypercholesterolemia, all of which can contribute to a shorter lifespan. Considering the distances these birds are meant fly daily in the wild while foraging, evading predators, hunting, and looking for roosting sites, it is remarkable that they do not succumb to more illnesses in captivity when deprived of this valuable exercise opportunity. We also see many birds in captivity with “behavior disorders” that do not exist in nature. For example, feather destructive behavior or self-mutilation, incessant screaming, over-aggression, and inappropriate pair-bonding with humans. We should not forget that flying is the greatest natural ability bird’s have. By depriving them of it, we may be setting them up for irreversible behavioral abnormalities. If owners ask about trimming in order to “tame” an unruly, dominant bird, we should educate them about current training options. Rather than trimming a bird’s wings so it MUST stay on our hands, we can train them through positive reinforcement to WANT to stay on our hands, even when able to fly away. Videos such as Barbara Heidenreich’s Parrot Behavior and Training DVD ( www.goodbirdinc.com) are great tools to offer to clients. These training techniques can make it possible to give birds in the home safe, and fun exercise by allowing them to fly. If clients are aware of these and other risks, and are able to monitor the bird during flight times, they should consider the benefits of allowing flight. If they feel that they can not safely avoid these dangers, trimming may be right for them. For those of us who years ago may have automatically trimmed wings as part of routine bird care, it is time to reconsider. While a flighted bird may not be right for every home, it is our job to educate and inform our clients of the pros and cons involved. As technicians, we must be equipped to discuss the option of in-house flight and be prepared to offer clients the information they need in order to make the best decision that will keep their pet birds safe and healthy. 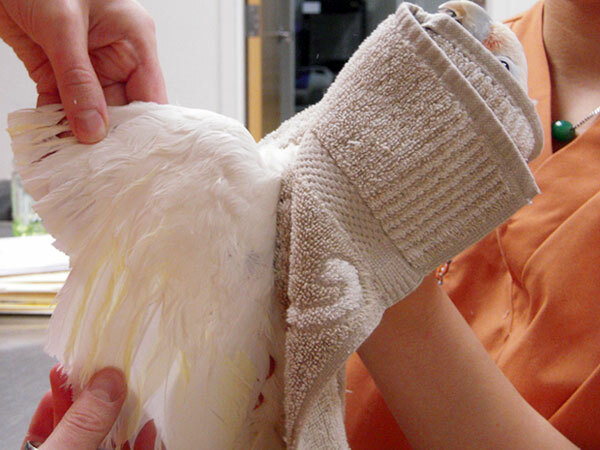 This article was recently published in the The Association for Avian Veterinarians newsletter.